Posted July 28, 2007 in 2007/07, Odds & Ends, Topic, z Archive. As I have been scanning Alarming Tales comics I kept coming across the above advertisement. I remember this ad from when I was young, it ran in a lot of different comics and did so for a number of years. I remember it because I always had a fascination with dinosaurs. When young I wondered what these particular dino figures actually looked like. I was not so naive to believe the illustration was a true representation of the actual model. As inflatable latex I am sure the toys were pretty crude objects. The thing is I have never seen one, and I suspect I never will. As cheap items sold to or for youngsters, it is quite possible that none have survived. This is not the only toy dinosaur I wonder about. When I was very young, four or five I believe, I played with a set of toy dinosaurs that included a gorilla, obviously inspired by King Kong. What made this set special is that this was in the days before plastic became so prevalent, these dinosaurs were made in wax. I am sure it was not typical wax, it must have been a compound made to survive a wide range of temperatures. But because it was wax the toys would not last too long before breaking. I remember them as a rather nice set, but since I was so young was that memory accurate? I would love to see them once more but with their fragile nature I again have to wonder if any survived. They are probably as extinct as the dinosaurs they represented. 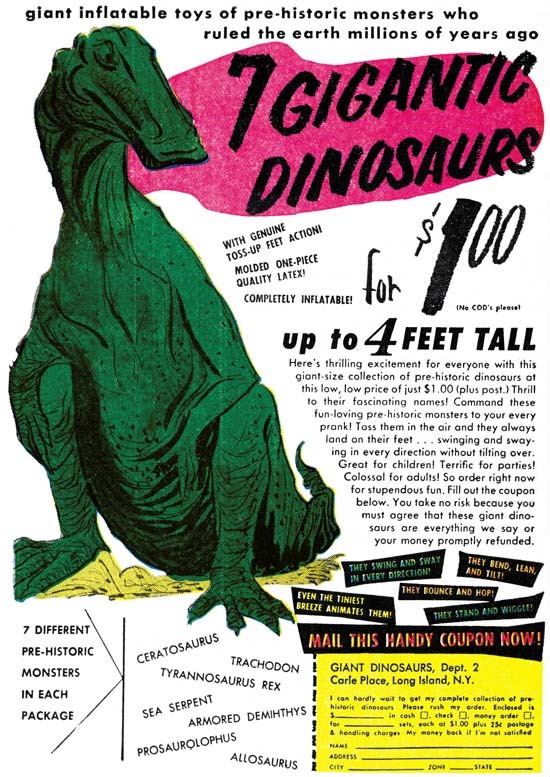 It probably is not that great of a loss if in fact none of the dinosaur toys discussed above have survived. They played a very small part of our history. What about comic books? Throughout their history comics have been considered unimportant disposable items of interest only to youngsters. However many artists worked on comics, and many more readers, however young, bought them. Surely comic books had an important impact on our culture. Surely the work of so many artists should not be silenced. Surely this is part of our history that is worth saving. But will it be saved? Yes there are a lot of active comic book collectors. Their treasures are protected in various types of sleeves. But it is a doomed effort. The paper the comics are printed have acid that makes them self destructive. I do not know when, but the day will come when they will all crumble away. There are some treatments that are supposed to stall the acidification but I cannot help but wonder if the cure is worse then the disease. There are people like me scanning their collections. But there is so much to scan I cannot help but wonder if it will all be recorded before it is too late. If you think this is unlikely to happen I recommend that you examine what happen to early films. Some movies have been completely lost, they were never copied before the cellulose they were made from disintegrated. Some of these films were considered significant pieces at the time. An important part of our history was lost. Posted July 28, 2007 in 2007/07, 7 Freelance, Featured Work, Harvey, Periods, Topic, z Archive. As I am in the process of restoring the last issue for Alarming Tales I ponder the significance, if any, of the change that came over the final two books. As I previously mentioned, I find issues #5 and #6 to have an Atlas flavor to them. An important contribution to giving AT an Atlas look is the cover artist John Severin. Well at least he is listed as the artist in GCD and some other Internet sources. Judging by some of John’s work for Atlas, such as the cover for Black Rider Rides Again #1, this seems like an accurate attribution. Although he had been only been working for Atlas for the last few years Severin had done a lot of work for them and his style was very much in tune to that publisher. Atlas seemed to prefer comic art that emphasized detail, a style I find rather dry. That is what we find for John’s rendition for the Atlas Tales #5 cover. AT #5 is over all realistic, almost illustrative, but note the fish-like mouth of the man in the foreground. Yes lots of details, look at all the machinery that can be seen through the door. But all things considered I am afraid this cover leaves me rather cold. John’s cover for AT #6 is even more detailed and has more figures. Generally I find this sort of art style dry and uninteresting. Not in the case of the AT #6 cover, Severin has really pulled off a great cover. Yes there is a lot of detail, but John maintains the Ambassador as the center of focus. The background figures provide just the right sort of emotional responses. With one exception, I do find the pointing man to be a bit awkward. A good deal of the success comes from the character of the Ambassador. Why would anyone think that the envoy from another planet should look like a British bureaucratic official? I do not know who came up with him, but he works. Not to diminish Severin’s art, but part of the success of this cover is due to the colorist. All the background is done in muted blue and purple as if under the shadow cast by the flying saucer. This has the beneficial effect of playing down all the background details allowing the Ambassador to stand out even more. The background figures also show small highlights of white. I am not sure whether these highlights really make any sense but they do add interest and help prevent the figures from appearing too flat. 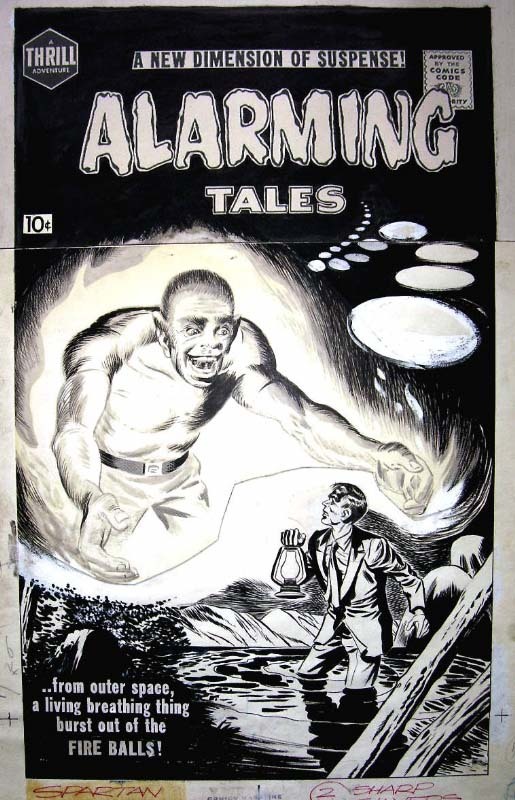 It was not just the cover art that leads me to say that Alarming Tales had become more Atlas-like. Some of the stories also had that flavor as well. Or at least they are rather different from previous Simon or Simon and Kirby productions. I will be writing about some of the stories in another post so I will leave it at that for now. AT #5 has a postal statement, the only one found in any Alarming Tales issue, which lists Leon Harvey as the editor and nowhere mentions Joe Simon. Could the alteration that came over Alarming Tales be due to a change in editors? I am not the first to warn against an over reliance on the postal statement. I believe that often the postal statement will list some one company personal as the editor even in cases where another person may be doing the actual work. Leon Harvey is one of the owners of Harvey Comics so we maybe dealing with just that sort of case. Although Simon did not do the covers for AT #5 or #6 he was not completely absent. I am uncertain whether Joe had any hand in the Contents page for AT #5 but he clearly worked on the Contents for AT #6. The figures in the first art panel look like they were done by Joe. I am less certain about the next two panels. The ambassador in the second panel is particularly well done and faithful to the story art. We have seen in the Harvey romance content pages that Joe could do excellent imitations of other artists. But the best examples of Joe imitations are close swipes from the story. In this portrait of the ambassador I cannot find a source from the story. In the end I am uncertain whether Joe did the whole introduction story or just the first panel. But his presence doing at least part of the contents page suggests that he was still acting as editor. 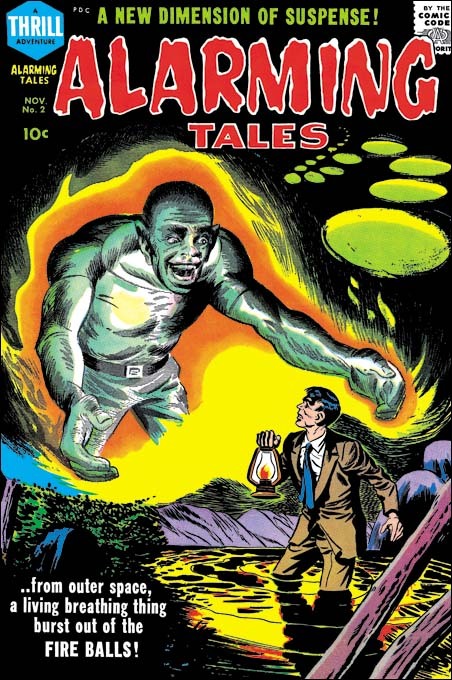 Of course if Joe Simon was still the editor why did Alarming Tales become so Atlas-like? Unfortunately I just do not have a good answer. Perhaps after the Implosion writers who had worked for Atlas took gigs elsewhere, including at Harvey. Maybe Jack Oleck was doing some of the writing for Alarming Tales. We know Oleck did some work for Atlas before the Implosion perhaps he continued to use some stylistic traits learned there. It is known that Oleck recycled stories from one publisher to another. Perhaps that was being done here, unfortunately I just do not know enough about Altas comics to say if any of their stories are too close for comfort with those in Alarming Tales. Posted July 20, 2007 in 2007/07, 7 Freelance, Harvey, Odds & Ends, Periods, Topic, z Archive. Previously I mentioned what a fine comic Alarming Tales #1 was. Actually the first four issues are rather good even though Kirby’s presence diminishes with each issue until with Alarming Tales #4 Jack is completely absent. I am less enthusiastic about issues #5 and #6. The final issues seem to have succumbed to a case of Atlas envy which resulted in less satisfying art and stories. I have been scanning and restoring Alarming Tales comics and last weekend I did issue #4. This has inspired me to write about an assortment of subjects with Joe Simon as the tenuously connection. A standard part of the Harvey comics format was the content page. Generally this was little more then using bits of the art or titles from the stories contained in the comic. With Joe as the editor or producer this simple format was often modified with the use of a short introduction for the featured story. Not long ago I provided examples of this from the romance titles. The romance introductions most often told a prelude to the featured story, but sometimes it was the comic book equivalent of a movie trailer. Interestingly the artist for the romance content page, usually Kirby but sometimes Simon, would imitate the artist for the featured story. Alarming Tales #4 also has a content page with a short story. Here Joe is the artist but he makes no attempt to imitate the featured artist, Jack Kirby. Jack’s story, “Forbidden Journey”, is about a boy who is so eager to escape into space that in order to get to the spaceport he commandeers a vehicle with almost disastrous results. In Simon’s prequel, the boy, appearing even younger, tries to sign up as a cabin boy. The spaceman who confronts him in the second panel seems unnaturally large, almost gigantic. I am sure Joe was well aware of this but does it as a way of indicating how intimidated the boy is. If that was not enough, the third and fourth panels show his interview with the leader. Here Joe uses an enormous screen showing only the leader’s face. This extra intimidation and the leader’s derogatory speech prove too much for the boy. I fully admit that Joe’s art for the content page really was not among his better efforts. But that seems to be typical failure even when Jack did the introduction story in the romance titles. These content stories really were not that important and probably were rushed jobs done after all the rest of the comic were completed. Science fiction played a significant part of Alarming Tales yet it only represented a portion of the stories from that title. AT #4 included the above ad for a new title, Race for the Moon, which would be composed entirely of stories from the science fiction genre. Such a full page ad for a comic was unusual for Harvey. Normally ads were either small ones for a single title or full page advertisements for multiple titles. Joe and Harvey must have hoped that such a prominent ad and the recent surge in interests in space due to Russia’s Sputnik would make Race for the Moon a big seller. Unfortunately it did not seem to work. 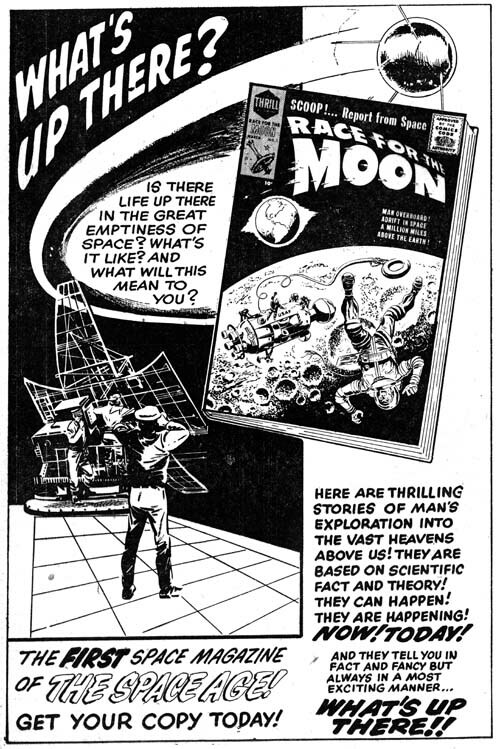 Included in the ad is a copy of the cover for the first issue of Race for the Moon. However it is not identical to the released cover. It shows the same astronaut and space craft that Kirby drew. The main difference is the more prominent use of the moon surface in the background of the ad version compared to the printed one. Also in the final cover the earth was more completely set in the blackness of space. Joe put particular effort in getting the covers just right during this period. 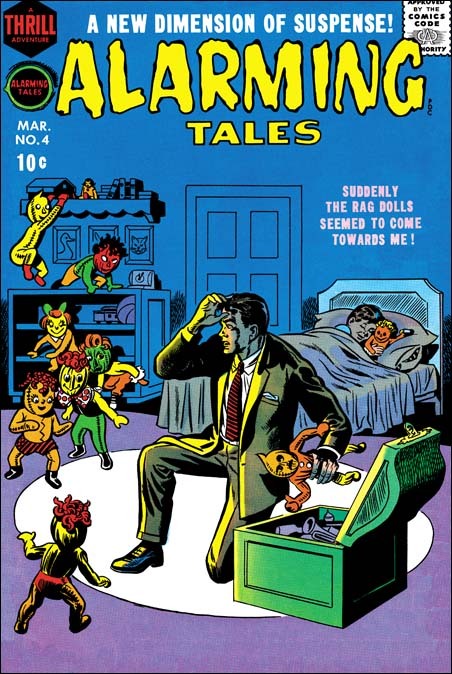 He completely redid the cover for Alarming Tales #1 from the original done by Jack Kirby (although that version was at first meant for Black Cat Mystery). Joe did two versions for the covers for AT #3 and #4 (I now agree with Nick Caputo that the AT #3 cover was done by Simon, not Kirby). In the case of RFTM #1 Joe probably thought that the astronaut and vehicle did not stand out enough in the first state. Simon therefore moved the distracting moon surface to the bottom of the image leaving the man and ship in the darkness of space. As I said not all of Alarming Tales was dedicated to science fiction. As appropriate for a comic with this title, some of the stories belong to the horror genre. Or at least as much of horror that was possible under the Comic Code. The cover for AT #4 depicts one of the interior stories “The Feast of the Rag Dolls”. I suspect when Joe did this cover he was thinking of a story and cover from Black Magic #1. In that story a rag doll with a demonic nature brings murder and mayhem to a family. For the cover to AT #4 Joe brings a whole troop of rag dolls to life. If anything the dolls’ smiles bring a threatening chill for their advance toward the surprised man. Alarming Tales #4 (March 1958) “Feast of the Rag Dolls”, final panel for page 4, art by Doug Wildey? 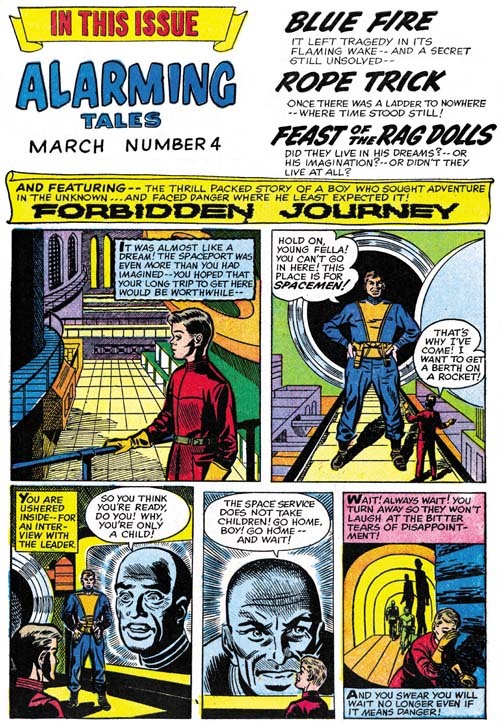 I attribute the story art for “The Feast of the Rag Dolls” to Doug Wildey, albeit questionably. I am not very familiar with Wildey’s work, I do not think he ever did any work for Simon and Kirby prior to this period. Nor did he sign anything he did for Joe at this time. That Doug did work for Simon is indicated because Joe’s collection has original art for “When Time Ran Out” from Thrill-O-Rama #1 (October 1965) with Doug’s name and address written on the back of one of the pages. I have read that Wildey made heavy use of photographs in drawing his comics. I can easily accept that because some of his work combines very realistically rendered images interspaced with more simple ones. In general I prefer a more “cartoony” style for comic books. I feel that with the small size of most panels all the details of an illustrative approach can actually make it hard to project the emotions in a scene. A more simple art combined with some exaggeration can completely overcome the difficulties of telling a story on the small pages of a comic book. Of course Jack Kirby is a great example of what an artist can do without being truly realistic. However I also feel that it is a mistake to look at an art form only from a single aesthetic viewpoint. Sometimes you have to put aside your own assumptions and try to adopt those of the artist in question. So when I try to accept Wildey’s more illustrative style I find that he really is a talented artist. Doug truly knows how to present a story, he is almost cinematic in approach. 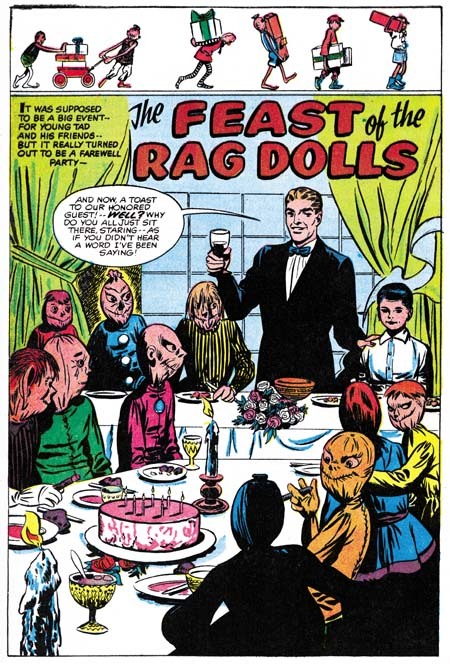 The only question is did Wildey pencil “The Feast of the Rag Dolls”? I make this attribution because of similarities between this story and the parts of other Wildey pieces that do not seem to be based on photographs. But I just do not know whether Doug would occasionally abandon photographic references throughout an entire story as would be the case if he were the artist for “Feast of the Rag Dolls”. The threat the rag dolls present to the man on the cover as presented by Joe Simon really was not part of the story. Actually the threat perceived by the boy’s parent is the obsession the boy shows for the dolls and his insistence that they talked to him. The parents appeal for help from the boy’s much older and very idolized brother. That brother decides to use the child psychology he has learned in college. He arranges a party for the boy and all his dolls. The older brother uses the party to indicate to the boy that the rag dolls really cannot talk and are nothing more then toys. It is a panel from that party whose image I have included above. Note that all the rag dolls seem slumped and lifeless in the chairs. But I love the way Wildey uses the shadows casts by the candles to provide the otherwise mundane scene with an eerie overtone. While I am not certain Doug Wildey penciled the story it is clear that the splash page was drawn by Joe Simon. Joe presents his version of the same party scene that Wildey did in the panel image I presented earlier. I am sure Joe fully knew the story because the older brother gives a speech chiding the rag dolls for not toasting the guest of honor. 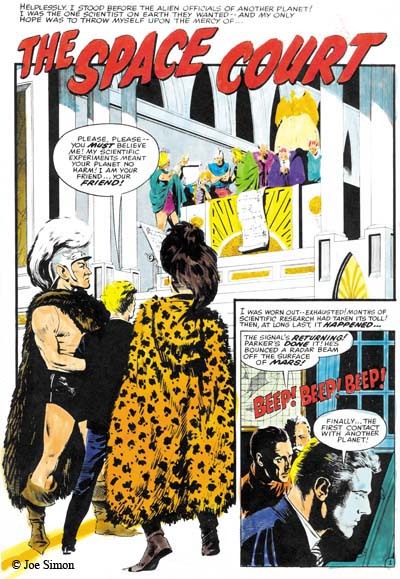 Yet despite this Simon does not present the rag doll guests in the slumped and lifeless manner as Doug Wildey had. Instead Joe provides us with rag dolls that look lively and are having a very good time. As if the emphasize their dynamic nature, Simon adds above a frieze of rag dolls prancing across with gifts. I doubt that any art form is grown in isolation from all others. Carefully examine the work of the earlier comic book artists and you will find they were influenced by syndication strips, magazine and pulp illustrations and the movies. Because comics were a part of pop culture it is not surprising that comic artists drew inspiration from other popular arts. What is infrequently found are any references to the fine arts. Crowd scenes are found in many art forms but only in the fine arts is it not unusual for one of the secondary participants to look back out at the viewer. That sort of thing is so rare in comic books that I cannot help but feel that when the rag doll in the lower right corner looks back at us, that is Joe tipping his hat to the fine arts. When an artist wants to include his self portrait in a group painting it is generally as that outward looking individual. So what do you think, is that Joe with his cigar smiling back at us? Posted July 14, 2007 in 2007/07, 7 Freelance, Harvey, Periods, Robots, Topic, z Archive. 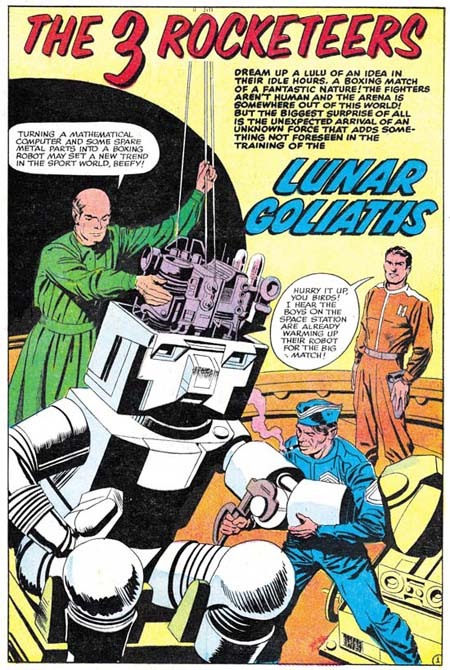 In the comments to my recent post on the Year of the Robot comic scholar Stan Taylor pointed out another robot story “Lunar Goliaths”. As he indicated although it was published in Blast-Off in 1965 it probably was originally intended for Race For The Moon #4 which, if it had not been cancelled, should have been published with a cover date of January 1959. 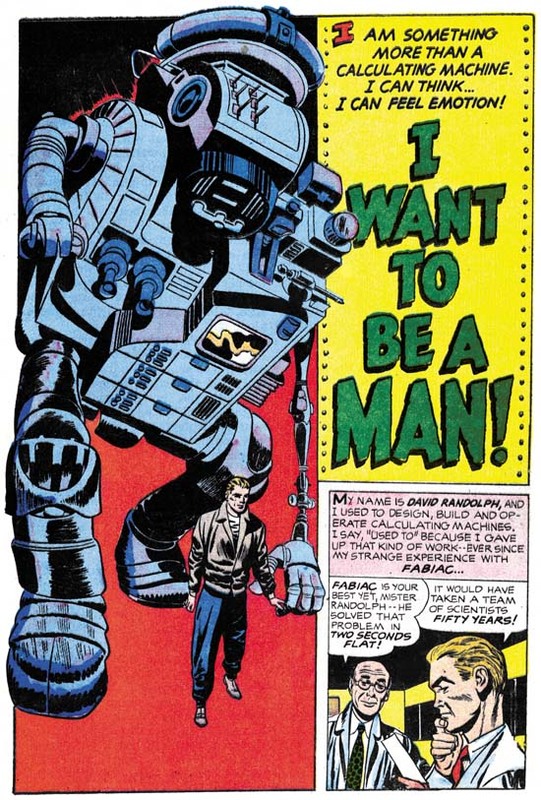 As with the other robot stories that I covered in my previous post, the robot in “Lunar Goliaths” is oversized and although has an broadly human shape is mechanical enough that it would not possible me mistaken for a man. Like two of the previous stories the robot achieves consciousness (in this case when struck by a meteor) but is destroyed by the end of the story. Joe Simon’s collection still includes much of the original art for Race For The Moon and Blast-Off. 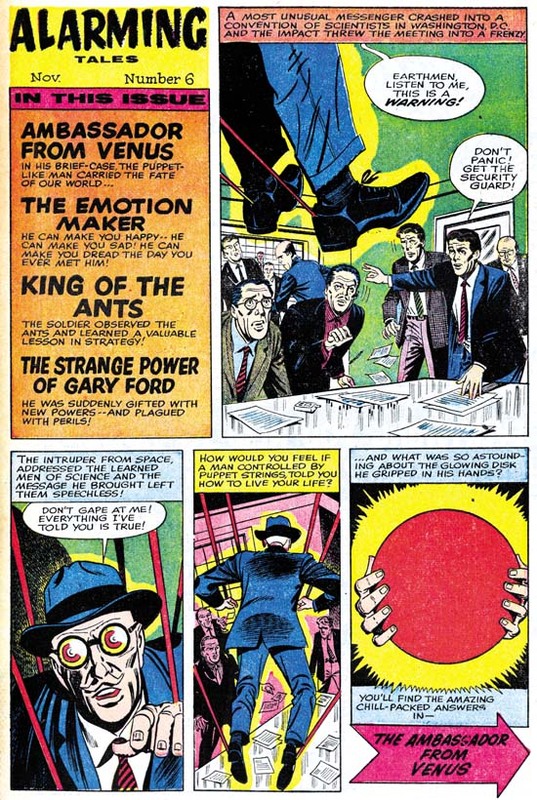 Joe has all of Kirby’s contribution to Blast-Off #1 (“Lunar Goliaths” and “The Great Moon Mystery”) as well as most of Al Williamson’s “Space Court”. Despite that fact that the art has not been trimmed, none of the Kirby pages show the Comic Code approval stamp. I suspect that Joe was going to send the pages for approval back in 1958 but did not bother once the title was cancelled. In 1965 Simon probably did not pay much attention and just mistakenly believed the art had already been approved. However all the pages Joe has for “Space Court” had received the Comic Code approval stamp on March 8, 1958. This not only shows that the story was originally meant for Race For The Moon, but was actually approved earlier then some of the art that was published in Race For The Moon #3 which have a March 28, 1958 stamp. Al Williamson not only provide two stories that were eventually published in Blast-Off #1, the Jack Kirby Checklist also credits him with inking the art that Jack penciled in that same issue. I have not carefully studied Al’s inking techniques but it does seem to me that inking of the Kirby art was much more restrained then that done on the Williamson story. However I am confident that the difference in inking technique was not due to someone else actually inking the Kirby art. The Kirby inker used the back of the art to either test or prepare his brush. He left brush marks that trace a curved path. This brush work only occupies a portion of the paper but it seems the inker also occasionally rotate the paper 90 degrees so that in the end the brushings would form a rough oval shape. This exact type of brush marks are found on the back of Williamson’s “Space Court” as well. Although I have seen other inkers leave brushings on the back of art pages, I have never seen any others remotely resembling Al’s unique marks. Simon’s collection also includes some color guides for Blast-Off. As can be seen by comparing the two scans, the printer followed the guide pretty carefully. I asked Joe if he had done the coloring. Joe replied that although he might do color guides for a cover he would never have done one for a story. Posted July 14, 2007 in 2007/07, 7 Freelance, Harvey, Odds & Ends, Periods, Topic, z Archive. 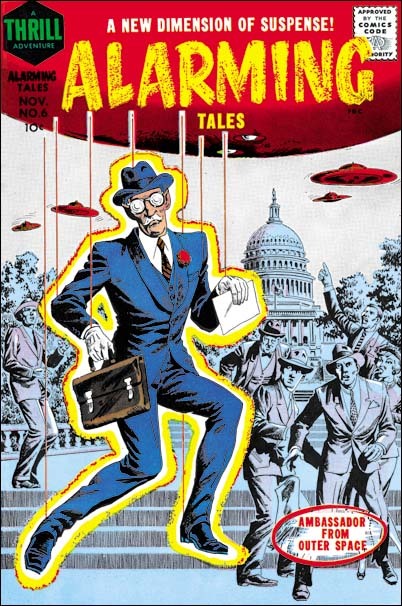 The cover for Alarming Tales #2 is surprising, considering Meskin’s otherwise absence from Joe Simon’s productions of 1957 and 1958. Previously I believed this cover was penciled by Joe Simon. Actually I still adhere to that attribution for the man on the lower right. 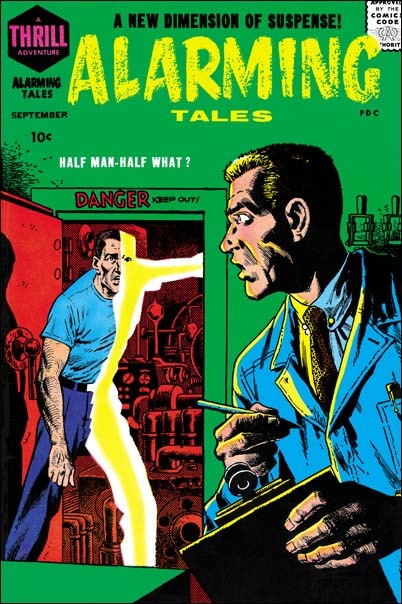 The similarity he has in his facial features and pose to other work by Joe, particularly the cover for Alarming Tales #4, leave me with little doubt that Joe was indeed the penciler. I have come to re-think my position about the figure of the giant after seeing the original art attributed to Mort Meskin by Paul Handler in the Comic Art Forum. (Paul has an excellent original art collection which includes some really nice Simon and Kirby pieces.) The facial features of the giant, particularly the eyebrows, certainly suggest Mort Meskin’s work. Unfortunately I really have no equivalent Meskin piece to compare it with. Meskin had done some work for titles like Black Magic and Strange World of Your Dreams but those titles lacked the science fiction emphasis found later in Alarming Tales and Black Cat Mystic. So the absence of similar figures by Meskin like the one on Alarming Tales #2 is not very surprising. So what can we make about this cover for Alarming Tales #2? Well here is where the original art really helps. The art shows that it actually consists of two separate pieces that have been combined. The edge that delimits them from each other marks an irregular path between the two figures. The giant does not accurately reflect the story the cover is based on (“Fire Balls”). In the story the strange visitors are roughly human in size and the flames they are ensconced in obscures their features. The differences between the cover and the story maybe nothing more then artistic license, or it might reflect that the Meskin portion was originally meant for something else. 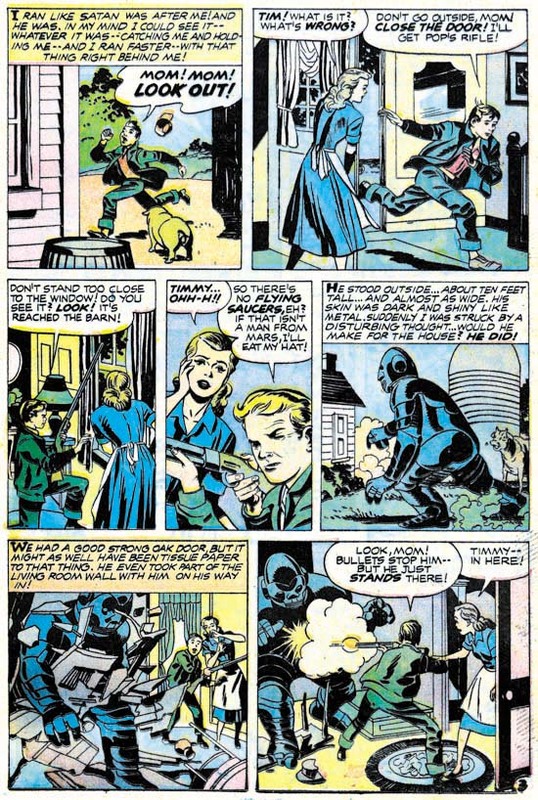 Mort did provide work for Black Magic up until the end of the first run (the last issue of the run was #33 cover dated November 1954). As I said above, Black Magic did not have much of a sci-fi bent but that might have been changing. The last issue had a story by Jack Kirby called “Lone Shark” that best belongs in the science fiction genre. So perhaps the Black Magic title was in the process of including more sci-fi just when it was cancelled. I doubt the Meskin piece was meant for a Black Magic cover since previously Kirby did every single cover for that title’s first run. But a splash page seems quite possible or it could have been meant as a cover for a never launched title. Whatever its ultimate source, the Meskin piece appears to have been modified for Alarming Tales #2 by the inking of the background. This combining of two different sources to make one piece is something I have seen Joe do before. His collection includes an unpublished romance cover constructed in just that manner. In the 60’s many of the covers for comics that Joe produced are combinations of original art and stats. Posted July 6, 2007 in 2007/07, 7 Freelance, Harvey, Periods, Robots, Topic, z Archive. 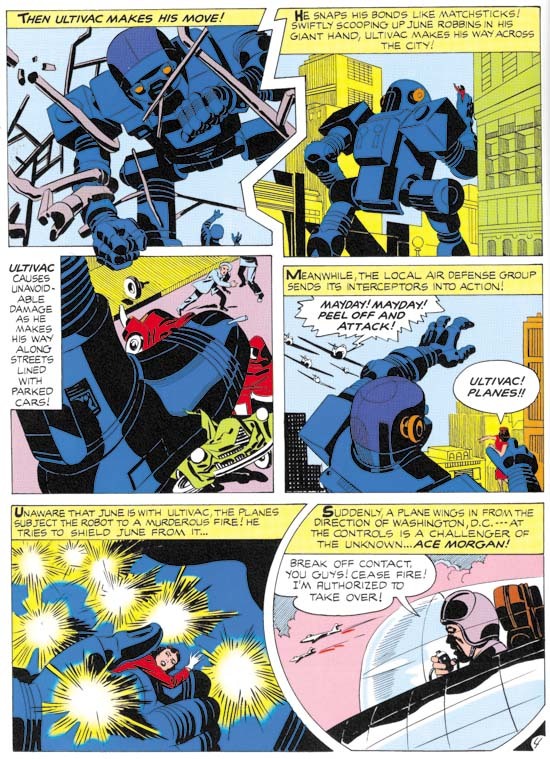 Generally speaking robots did not appear often in Simon and Kirby productions. But for some reason S&K produced three stories about robots over a single year towards the end of their collaboration. Actually I am doing a bit of a stretch when I say that. It is not clear that it is a robot in one story, “Gizmo”, but it sure looks like one. Another story is an early Challengers of the Unknown and although Joe Simon help create that team it is uncertain if he had anything to do with the initial stories. SPOILER ALERT: I will be discussing stories below including their endings. so do not proceed if you have not read these yet but still want to. The sudden appearance of the large Gizmo brings terror to a small family. Neither the walls of the house or bullets will stop it. In the end the family’s baby puts an end to Gizmo’s destruction, he was only looking for someone to play with. The arrival of an even larger version showed that Gizmo was just a baby. As I discussed above, Gizmo may not really be a robot. In fact the boy describes him as a man from Mars. But clad in metal he sure looks like a robot and we do not learn he is a baby until the end of the story. After all how could a baby robot possibly grow? An evil scientist creates the ultimate machine. Unfortunately for him the robot escapes. It is the Challengers of the Unknown team to the rescue! Except a beautiful scientist seems to be the one that convinces Ultivac that he need not fear humans. A meeting is arranged with the leaders of the world where Ultivac promises to help mankind solve many of their problems. But up springs the mad scientist who destroys Ultivac rather then lose his creation. Ultivac can still be used as a computer but is no longer sentient. A scientist’s advanced computer develops consciousness. To keep Fabiac happy, the scientist makes him a robotic body. This ploy works until Fabiac sees himself in a mirror and realize he never will be human. Gee you would think he would just look at his hands and see something was not right. There seems to be a common threads to these stories. In all of them the robot is very large and only marginally human in shape. This was done to make so that their fearsome appearance would belie their true nature. In all three stories it turns out that the robot does not truly want to hurt anyone. In two of the stories the robot wants to help mankind, but that help is ultimately lost. The robot for the last two stories have similar names; Ultivac and Fabiac. These are take-offs from the names of two very real computers. ENIAC (Electronic Numerical Integrator And Computer) was completed in 1946. UNIVAC (UNIVersal Automatic Computer) was first released in 1951. These were very significant and widely reported developments. By the time these stories appeared, UNIVAC cost about a million and a half dollars. That is a lot of money even today (50 years later) especially since the computer may only have had 60 kilobytes of memory. I have no idea what was the source that sparked these robot stories. Part of the explanation was that S&K stories had gotten substantially more science fiction based at this time. Still it is likely that something in particular inspired this effort. I do not think it was the movies. “The Day the Earth Stood Still” (1951) had a large robot but it was not nearly as large or “roboty” as in these stories. “Forbidden Planet” (1956) had a sufficiently convincing robot but it was neither large nor threatening. I suspect the source was some science fiction pulp or book that Jack and Joe had read. Posted July 6, 2007 in 2007/07, 9 DC (late), Alternate Takes, Topic, z Archive. Some time ago I received an email from Kris Brownlow asking if I knew anything about a Sandman cover drawn by Jerry Grandenetti. Kris thought he remembered seeing it on eBay in the late 90’s. Unfortunately I knew nothing about the cover nor was Kris able to find anyone on various comic lists who knew anything either. When I asked Joe Simon he confirmed that Jerry was involved in the early stages of the Sandman proposal. That tantalizing state was were things remained until recently Kris stumbled on a printout that he had made, and forgotten, of the original eBay image. I would like to thank Kris not only for the scan of the printout he provided but also for his diligence in uncovering this fascinating piece of comic book history. I have done some Photoshop adjustments of the scan, but because it is a second generation copy of what was probably a poor scan to begin with, there was a limit to what I could do. Both Kirby and Simon were working for DC in the early 70’s. Jack’s New Gods titles had not been as successful as hoped and DC had him doing other things such as Kamandi. Joe’s DC work was more on the lines of a creator, writer and editor. The art for Joe’s books was done by others, including Jerry Grandenetti. Since Joe’s titles would last only a few issues I would hazard a guess that his books were not big sellers. 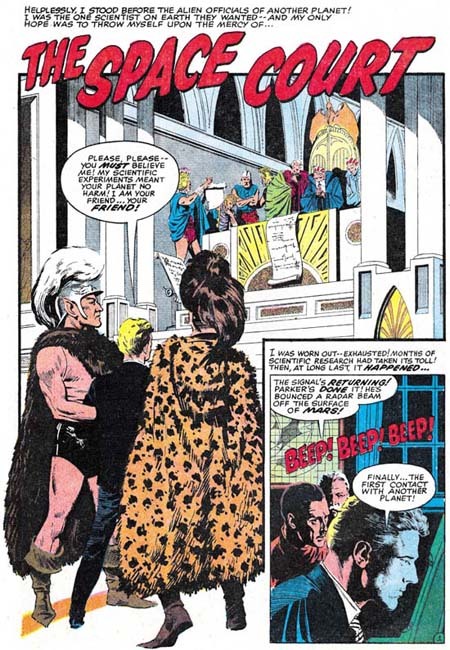 It must have seemed obvious to Carmine Infantino to try re-uniting the Simon and Kirby team. Perhaps with a bit of arm twisting, Carmine persuaded Jack. So after many years of working separately, Joe and Jack produced Sandman. The comic seemed to sell well enough but Kirby had his own personal goals which did not include turning back the clock to a long past working relationship. More issues of Sandman would follow and Jack would contribute covers and eventually some story art, but he would do so without Joe’s help. 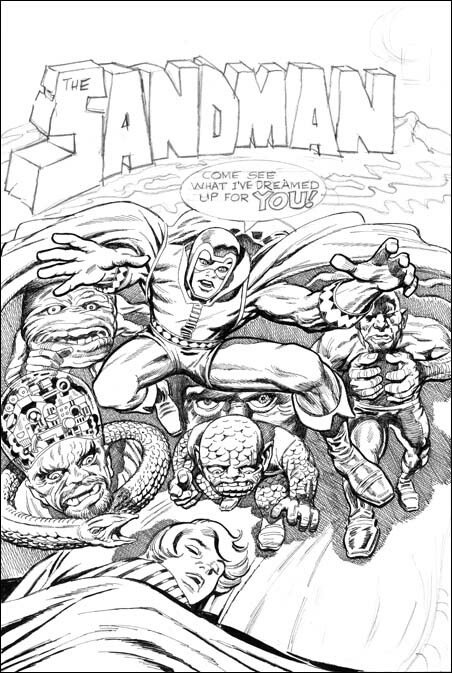 Unpublished Sandman cover, pencils by Jack Kirby and inks by Joe Simon. 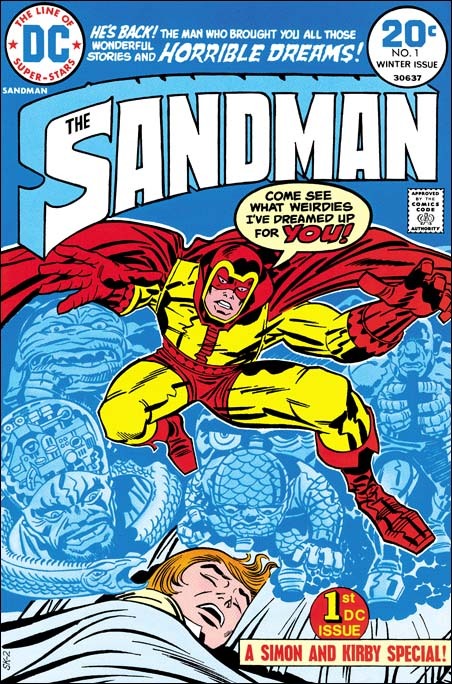 Joe Simon inked a version of the Sandman cover drawn by Jack Kirby. Perhaps because of Joe’s use of crosshatching (which DC staff derogatorily called hay) or because of the liberties that Joe took (such as rounding off of finger tips), this cover was never published. But it does stand as an intermediate state between Jerry’s version and the final published cover. Kirby must have seen Jerry’s rough, or perhaps some other intermediate layout that we do not know about, because Jack keeps a couple figures. Most notable is the machine headed guy on the left in both versions. The pose of the legs of a scaling demon on the second state is similar to a larger figure higher up on the page in Jerry’s sketch. Jerry had a number of serpents on the left side which was reduced to a single one in the Kirby/Simon cover. The above similarities were unchanged in the final published state. But there are other features shared between the Grandenetti and the Kirby/Simon versions that did not survive to the final cover. Both have the Sandman logo looking like it was made of stone. The logo in both sits on what looks like a swirling river. This river sweeps down from the right to the left but in Jerry’s rough, though not the Kirby/Simon art, the river turns back in to form part of the divide between the nightmare world and the sleeping boy. Both early states seem to have a mountain formation the immediate right of the end of the logo. Come see what I dreamed up for you! Come See what I’ve dreamed up for you! Come see what weirdies I’ve dreamed up for you! Other features are only found in the initial Grandenetti state. Such as the text that also separates the nightmare scene from the sleeping boy. Or the hand raising up from the river holding a doll. There are other figures but with the poor quality of the scan of Grandenetti’s drawing it is hard to make out what some of them represent. The most dramatic change was made to the Sandman. In Jerry’s rough the Sandman is easy to overlook standing on the right among all the chaos. With the second state the hero becomes front and center with the exaggerated perspective that Kirby so favored. Except for the inking, the published cover is not very different from the rejected Kirby/Simon version. The rock formation logo has been replaced with a more modern and sleek version, but otherwise keeps the overall form. The flowing water and mountain have been completely eliminated. Since we have three versions of the Sandman cover, are there more? Joe’s collection includes two copies of the Kirby/Simon state. These copies do not differ significantly in layout from the second state and I believe they were actually made years later. The published comic has a job number of SK-2 so what was SK-1? Very likely SK-1 was the Kirby/Simon version. 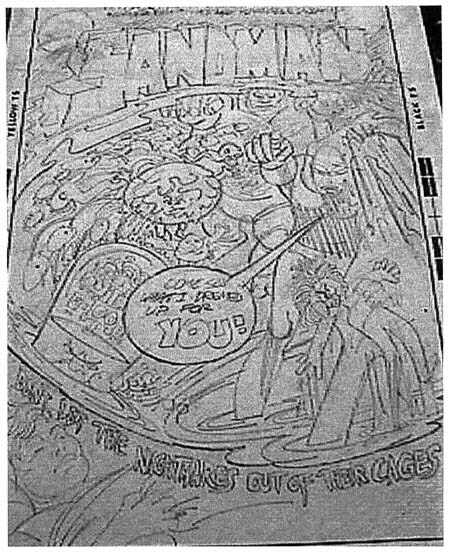 I have seen on a couple occasions the original art of another Sandman cover rough purportedly done by Joe Simon. On that example the drawing is very amateurish and was certainly not done by Joe. Who knows, maybe there are more Sandman covers out there?